Kelual DS cream is specially formulated for the care of irritated skin, with redness and dander located in the fatty areas of the face, the wings of the nose, the eyebrows, and the edge of the scalp. - keluamid and guanidine glycolate act together to eliminate surface-adhered dander (dead cells of the epidermis). Its non greasy texture and easy to apply makes the Kelual DS cream very pleasant to use. 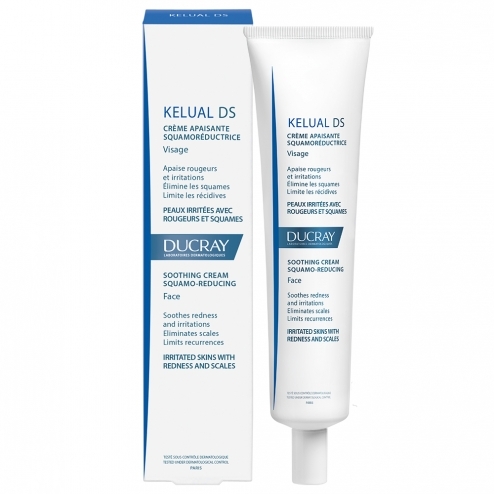 Kelual DS cream reduces irritation, redness and dander to leave skin smooth and clean. 1. Attack phase: apply Kelual DS cream morning and evening after a gentle cleansing with a suitable hygiene product, for 2 weeks. A clear improvement appears after one week but it is necessary to persevere to maintain good results of the treatment. 2. Maintenance phase: Apply Kelual DS cream 2 times per seamine. INCI formula: Aqua, caprylic / capric triglyceride, cyclomethicone, dicaprylyl ether, cetearyl alcohol, MEA acetamide, glycolic acid, guanidine carbonate, glyceryl stearate, ceteareth-33 polymethyl methacrylate, crotamiton, glycyrretinic acid, piroctone olamine, serenoa serrulata fruit extract, tetrasodium edta, tocopherol.